Undercliffe Cemetery01274 642276work Historic SiteUndercliffe cemetery was opened in 1854 by the Bradford Cemetery Company. The 25-acre site, high above the city, contains many grand nineteenth-century monuments: tombs fit for pharaohs, finely decorated obelisks, extravagant mausoleums and huge columns abound. It has been described as one of the most striking achievements of Victorian funerary design. Many of the rich and famous and notable inhabitants of Bradford have been buried there, along with veterans of famous conflicts such as Waterloo, the Crimea and the Indian Mutiny, and many ordinary but no less interesting citizens. After the original Cemetery Company folded in 1975 the cemetery was neglected. Local people began a campaign which led to Bradford Council compulsorily purchasing the cemetery from its private owner, declaring it a conservation area, and then sponsoring a two-year restoration programme. The cemetery which is still in use for burials is now in the care of the Undercliffe Cemetery Charity, a voluntary group who maintain and promote the site as a valuable educational resource and monument to Bradford's Victorian Heritage. The site is Grade II* listed, it is registered by English Heritage Parks and Gardens of Special Historic Interest and is a designated Conservation Area. 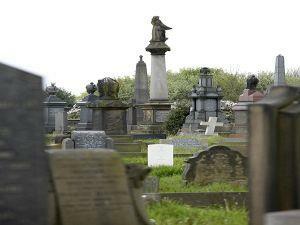 Undercliffe cemetery was opened in 1854 by the Bradford Cemetery Company. The 25-acre site, high above the city, contains many grand nineteenth-century monuments: tombs fit for pharaohs, finely decorated obelisks, extravagant mausoleums and huge columns abound. (Saturday/Sunday/Bank Holidays 09.00 - 18.00). When closed the cemetery is not accessible to vehicles or pedestrians.